Front row, from left: IAM District 160 Business Representative Glenn Farmer and Committee members Gregory Erickson and Jerry Pike. Second row: Trustee Ronald Morris, Committee member Darn Larson and Chief Steward Agustin Galindo. Third row: Committee members Calvin Cardwell and Justin Shannon. 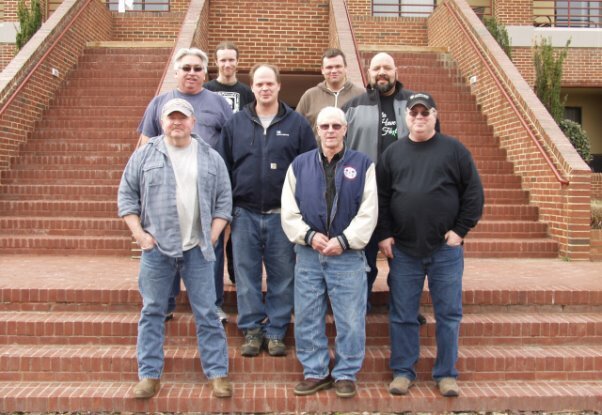 The IAM Local 2379 Negotiating Committee, along with District 160 Business Representative Glenn Farmer, recently took part in the Negotiation Preparation for Bargaining Committees program at the William W. Winpisinger (WWW) Center in Hollywood, MD. The Committee represents employees at Alcoa Intalco Works in Ferndale, WA, one of the few remaining primary aluminium smelters left in the United States. The current contract expires October 16, 2015. Recognizing that this promises to be a difficult round of negotiations, the Committee strategized to change bargaining history, map a new direction for relations with the company, put better language in the contract, and to build solidarity in the bargaining unit.